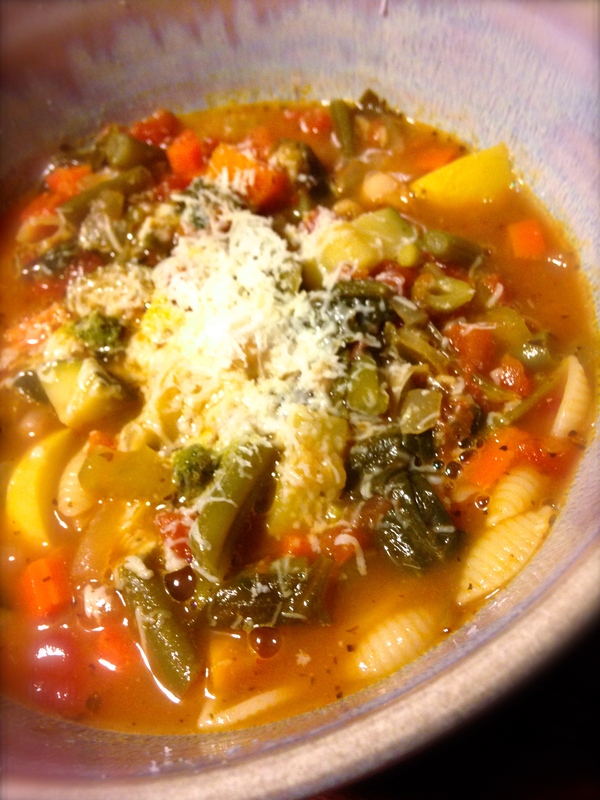 Oh Minestrone… How I love thee. It, like so many food memories, takes me back to childhood, to memories that are so old and faded that they’re best described by colors. A whiff of a maturing minestrone soup on the stovetop will transport me to a time when chairs were something I had to climb to sit on. 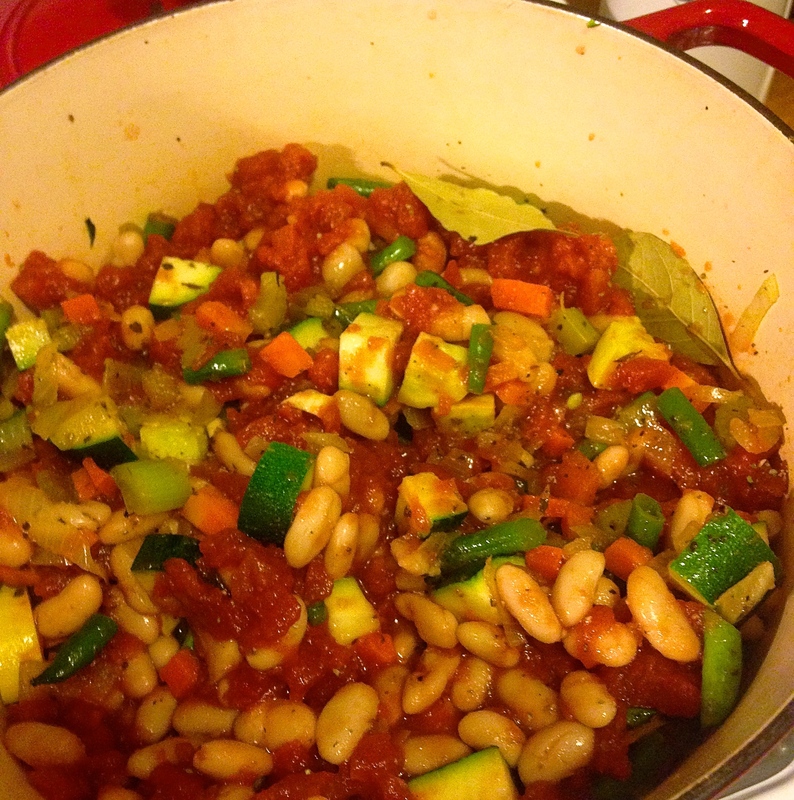 It’s bright and savory, steeped in herbs and hearty with cannellini beans and pasta. I spent a few days last week working with a fellow food lover. We spent hours talking about this spot and that, our favorite dishes and preparations. We swapped tips and techniques and sat down to two exceptional working lunches. At one point minestrone came up (he uses swiss chard, brilliant) and it got it stuck in my craw, the craving sat in the top of my stomach from the moment it was breached. By hour 40 I had broken. It had to be done. Get everything out and organized. Set up a slop bowl for peels and ends, it keeps you from running back and forth to the trash. Splash some olive in a pot on medium, break down your onions, carrots and celery into small bits. Salt & pepper, 2 layers of thyme, 1 layer of marjoram(or oregano) and a dash or two of basil and sage. Stir the mix and put the burner on medium high. Get to work on those green beans. I’ve never really figured out a perfect method with beans. I just snap off the stalk end with my fingers and work my way through the pile. Snap, next. Snap, next… Then I try to bundle them all like matchsticks and cut them into 1 inch pieces. Slice the garlic, toss it in. Quarter your zucchini and summer squash and chop it down. Into the pot it goes. More salt and pepper. Stir. Add the tomato. Rinse the beans good if they’re out of a can and put them in. Salt, pepper, another coating of herbs. Bay leaves. Stir. Note the order I did that in. Onions first, almost always. Everything else goes in order of vegetable firmness. Garlic usually in the middle, you don’t want it to burn and get bitter. Give this a few minutes. Absentminded? OCD? Set a timer for 4 minutes and twenty three seconds. Pour in your 6 cups of broth and stir. Turn heat to high and cover. Do you have any old Parmesan rinds kicking around? Got a great tip this week, save your rinds in the freezer. Pull them out for jobs like this. I happen to have one in the fridge. Toss that in the soup. Bring to a boil. This is where I clean up my mess. A clean kitchen is a happy cook! Working quickly I had enough time to clean up all the dishes I had just used and wipe down the counters. Once the soup is boiling give it another stir and turn the heat down to medium high. At this point you can do it a few different ways. If it’s the weekend and you feel like torturing your friends and family, turn down the heat and take your time. Let the smell whip the guests into a frenzy. (A trick I learned from my mother) They’ll be knocking each other over by the time you’re ready to serve. If you’re in a hurry like me, keep whipping that soup into a boil. Ze flavors must marinate! Ze broth must reduce! Work soup work! A boiling soup is a reducing and thickening broth. You need some of that to concentrate the flavors but you don’t want it too thick. I like my soups with a lot of broth so I keep the cover on for most of the cook, pulling the lid off at the end for a mad dash 5 minute reduction. It’s a balance. You can always thicken more with uncovered heat. Thinning the broth is a little more complex and I try to avoid it. Boil some water for your pasta and get that going. Follow the instructions on the box for timing. Drain the water and set your pasta aside. Why do this? Extra steps and extra dishes? Not usually our style here in the mancookgood kitchen. I do it because I don’t want to leave the pasta in the soup for leftovers. Same goes with rice. It continues to absorb the liquid and by day two or three my beautiful broth is a solid block of bloated pasta. It’s like a parasite sent to drink up all that goodness. Like Uncle Jack, it never stops drinking.Not today Mr. Cavatelli. Not today. By this point your soup should be beginning it’s descent into flavorland. Drinking a glass of wine? Red? I was. Splash some in at any point. Slice your bread and get it ready. (Toasted? I did) I like to put it in the toaster oven pre buttered. It makes for a soft interior and crispy edges. Who doesn’t like crispy edges? Bring them to me. Add the spinach. Yes, all of it. It reduces, trust me. Stir it in as it shrinks. Taste the soup. It should almost be there. Check the carrots, make sure they’re soft. Turn up the heat and take off the lid. Please put your tray tables up and in an upright position, the pilot has turned on the fasten seat belt sign. 5 more minutes of an uncovered boil, taste it again. Hot! Here’s the most important part. Spoon the soup and some cooked pasta into a bowl and grate your cheese over it. This is nearly non negotiable. Lactose intolerant? How bad? Grate the cheese and take a pill or something. Sprinkle some chili flakes and a spot of pesto if you have it hanging around. Serve with the bread and a smile. Make the soup. Win the day. It’s been 4 days since the Thanksgiving feast. Our cravings for holiday fare have subsided a bit. Once bountiful supplies have dwindled and a storm has blown over the Los Angeles Basin. It’s cold, dark and wet outside. We are running our artificial lights during daylight hours. The doors and windows are shut tight, the heat has been turned on. Even the ceiling fans have been silenced. It will be days until we see 70 degrees again. These are truly the dark days of winter here in Southern California. I am left with no choice. 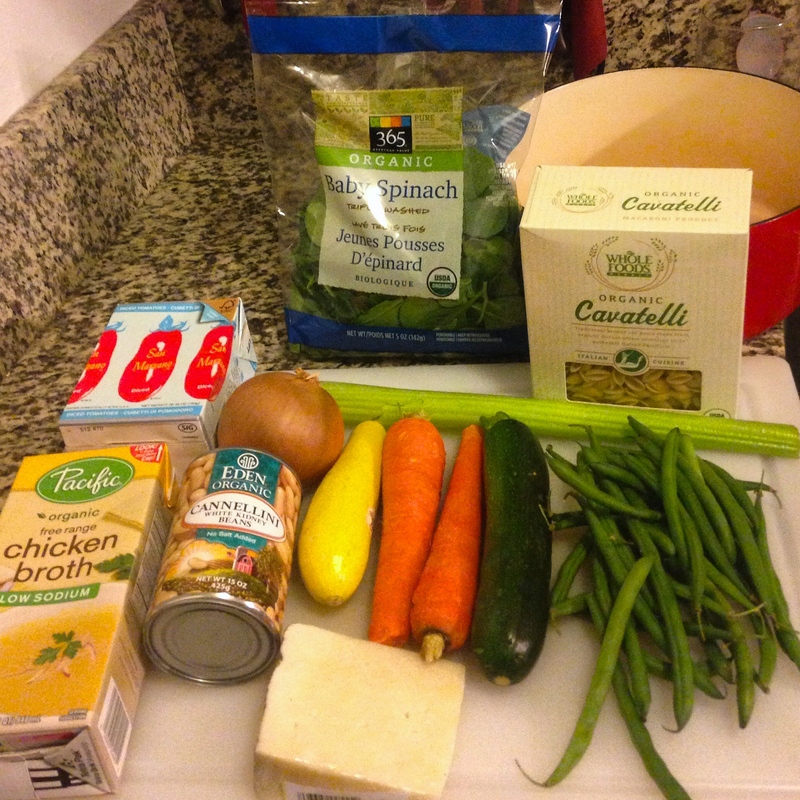 I must make a soup to nourish my friends and family and boost morale. We will find comfort in homemade stock and thyme and rosemary. We will find inspiration in the turkey who sacrificed himself for this noble task. We will carry on. Hopefully you took the stripped down turkey carcass and boiled it in water for 2 hours last Thursday. Tell me you did. (It’s ok if you didn’t, just a missed opportunity on both of our parts) For now, let’s assume you did. That means you have about a gallon of liquid gold, err turkey stock. That’s a good start. Chop the leek into thin strips and toss it into hot olive oil. Salt and pepper it. Chop up the garlic and toss add that too. 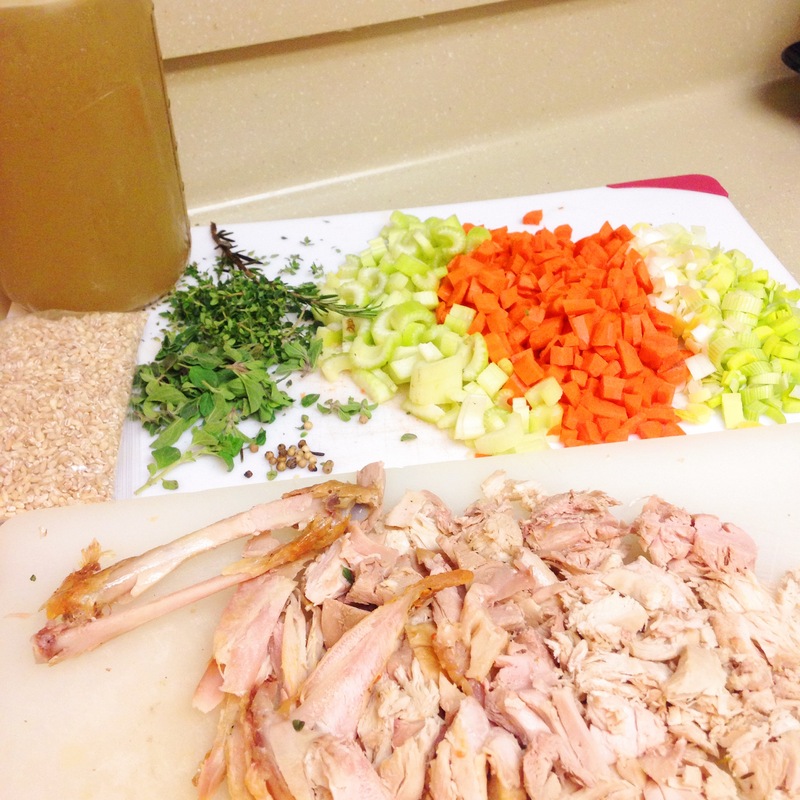 Break down the carrots and celery into small uniform pieces. Big chunks work too, it just cooks faster and is easier to eat in smaller pieces. Put that all in with the onions, stir and add salt and pepper. Give that a few minutes. Use that time to clean, organize and get your herbs out. I had a lot of fresh ones leftover from Thanksgiving so they needed to be broken down and chopped. Lots of thyme (if dry, cover the surface of the liquid in 2 layers, if fresh, use a loose handful), half as much rosemary, half of that in sage. It really it doesn’t matter much and is to your personal preference. We’re making soup. Add more as you go. It’ll be delicious. Pour in the broth and add the herbs. Salt and pepper again. Add the turkey and barley and set on medium high heat with the cover on. This is when I clean up the kitchen. (again) I like it tidy when I cook. It keeps things moving smoothly. By the time you’ve wiped down the counters and washed up your prep dishes the soup should be boiling. Give it 45 minutes with an occasional stir. By then things should be pretty close to done. Take the lid off and keep it on medium high for another 30 minutes. At this point you should be checking in every ten minutes or so. Have a taste. (HOT!) Does it taste like soup yet? If not give it more time. The color, smell and taste of the soup will shift when it’s done. I’m sure there is a scientific reason for it but I like to think that the separate ingredients finally yield to each other and collapse into a group hug. If you’re watching the broth you’ll be able to tell. Right at the end I turn off the heat entirely and squeeze the half of a lemon into the whole mixture. 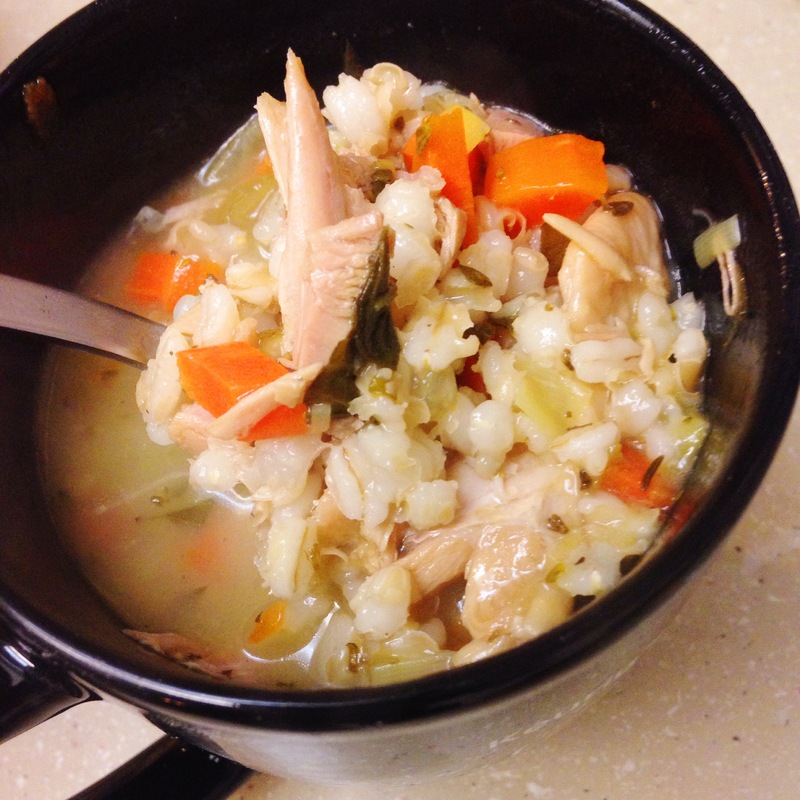 This lets the flavors settle in and the soup cool enough for people to eat. I took a fresh baguette smeared with olive oil and broiled it in the oven for a few minute. The soup was served in mugs. Six people ate, several had seconds. Nothing was left behind.